15 self care practices to incorporate into your daily healthy living habits. These simple and small intentional habits will calm your mind and bring happiness into your every day routine. When was the last time you took 10 intentional minutes for yourself? Ten minutes that was solely for you and your well-being, not focused on the needs or wants of others. Is it too hard to think back that far? Then it’s time to start putting yourself first by incorporating a practice of self care. The majority of our life time is spent on others: our employers, our families, our friends, and even our pets. In the hustle and bustle of every day life we often lose sight of the fact that taking care of ourselves first and foremost is the key to being able to better serve those around out. Without a strong sense of well-being we are doing a disservice to ourselves and those close to us. But how do you start prioritizing a self care practice? 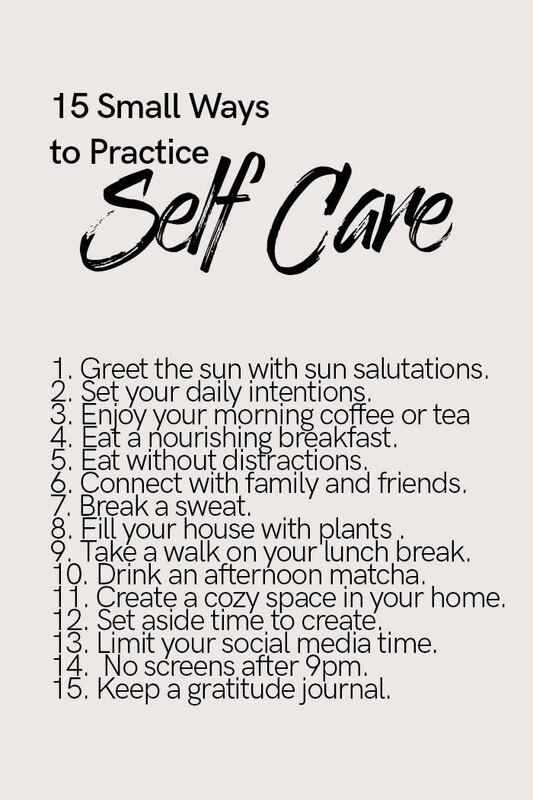 Below are fifteen simple self care practices to incorporate into your daily routine. Start by incorporating one self care habit a day into your healthy living routine, I promise you will be happier and healthier when you start prioritizing you! Greet the sun with sun salutations. Start your day with a short yoga flow of sun salutations first thing in the morning (yes, even before looking at your phone). Research suggests starting the day with light physical activity like yoga may lead to increased happiness and productivity throughout the day. Try this intentional yoga series from Harvard Health first thing in the morning to start the day with namaste. Set your intentions for the day. Take five minutes to journal your thoughts and to set intentions for the day. 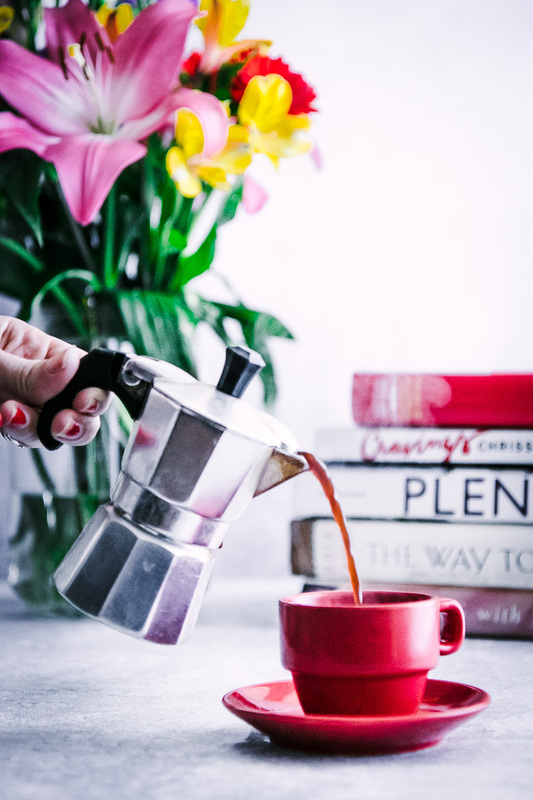 Setting your intentions in the morning will help your mind stay on track with the important things and keep you from spending your attention on the things (and thoughts) that don’t matter. Carve out ten minutes to sit and enjoy your morning coffee or tea. Are you a wake, grab a coffee, and run kind of morning person? Starting your morning unprepared and in a rush sets the tone for feeling frazzled all day. Set your alarm a bit earlier to spend ten minutes enjoying your morning coffee or tea without the rush. Eat a nourishing breakfast. Eating a nutrient-rich breakfast nourishes your mind and body first thing in the morning and allows you to face the day feeling your best. Make sure your breakfast includes a protein, carbohydrate, and a healthy fat, like this Saffron Chickpea Chard Hash with Sunny Egg. Eat. At a table. Without distractions. Distracted eating can lead to poor food decisions and overeating, since your body’s natural satiety cues are less likely to be recognized. Set aside ten minutes to sit down at a table and enjoy your food to set the tone for a mindful day. Connect with friends and family offline. Make it a point to connect offline with at least one person. Whether that means a quick coffee after work, a phone call with your long distance family, or having a chat with your significant other over dinner instead of watching the television, making a point to meaningfully connect will not only strengthen your relationships but bring you joy and happiness. Break a sweat. Exercise is not only great for your body, but it is also a mood booster. Set an appointment with yourself to move your body for at least 30 minutes a day. Treat yourself to an afternoon matcha, kombucha, or tea. Feeling sluggish in the afternoon? Try sipping on your favorite beverage like a ceremonial matcha or kombucha. Sometimes the act of making yourself a small treat provides more health and mood benefits than the actual drink itself. Fill your house with plants and flowers. I was never one for keeping flowers in the house but recently came around to the mood-boosting effects of seeing fresh blooms every day. Research shows keeping plants improves a sense of well-being and having fresh flowers brings small moments of joy. Create a cozy space in your home for mindful moments. Carve out a space in your house that is devoted to only self care activities like lighting a calming candle or burning essential oils. Make a small nook out of the chair in your living room, convert your balcony into an inviting outdoor space, or set up your side of the bed as your cozy comfort zone for doing the activities that bring you joy. No phones allowed! Set aside time to create. Do you love writing, knitting, photography, or cooking? Setting aside even ten minutes a day to devote to your hobbies can be calming and inspiring. Set social media times and stick to them. One of the biggest game changers I implemented into my life this year has been setting intentional time for social media. I set aside 20-30 minutes at the end of each day AFTER work, exercise, and other commitments to share and connect intentionally. No screens after 9pm. Setting a time to turn off the television, computer, and phones each night will not only help you decrease your total daily screen time, it will also help you to sleep better. Research shows that blue light from tv and phones can have an effect on sleep quality, so shut down the devices and instead crawl in bed with a good old fashioned book (ok, or a Kindle). Keep a gratitude journal. Jotting down a few things you are a grateful for every day can remind you of the good things you have in your life when you’re feeling down. Write down three things that you have gratitude for everyday in your gratitude journal before bed to put you mind in a happy headspace before sleep. Want more self care and intentional living tips? Join the Fork in the Road Newsletter for weekly slow living advice and feel good food recipe recommendations!